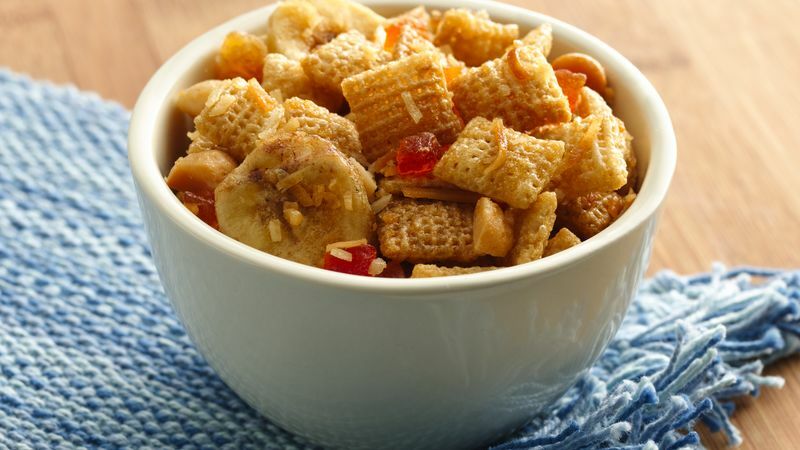 In large microwavable bowl, mix cereal, coconut, banana chips, tropical three-fruit mix and nuts. In microwavable measuring cup, microwave butter uncovered on High about 30 seconds or until melted. Stir in brown sugar and pineapple juice concentrate. Microwave uncovered on High about 30 seconds or until hot. Stir; pour over cereal mixture, stirring until evenly coated. Microwave uncovered on High 6 to 8 minutes, stirring every 2 minutes, until mixture just begins to brown. Spread on waxed paper or foil; cool about 15 minutes. Store in airtight container. Use up the extra juice concentrate by mixing with club soda for a tropical drink. Oven Directions Heat oven to 300°F. In ungreased large roasting pan, mix cereal, coconut, banana chips, tropical fruit mix and nuts. In 1-quart saucepan, heat butter, brown sugar and pineapple juice concentrate over medium heat until hot. Pour over cereal mixture, stirring until evenly coated. Bake uncovered 30 minutes, stirring after 15 minutes. Spread on waxed paper or foil to cool, about 15 minutes. Store in airtight container.